ALL cars racing this year must have the front part of the rear wheel arch in place, if removed they must be made of steel. No plastic or aluminium. Outer sills maybe replaced with Tin but part of the original sill with the drop-down lip must still be in place, the guts in between inner and outer sill may be removed this is mainly on a Tigra ‘B’ where there is possibly 30-40kg of weight. Cars that haven’t got inner sills must have them replaced by the 1st of January 2020. The ‘A’ pillar can only be cut a maximum of roughly 1” above the top wing iron & roughly 1” below the bottom door iron and the rest must stay in. If the ‘A’ pillar is removed this must be back in place for the 1st January 2020. Rules for 2020, any car that hasn’t raced before this date must have the original rear-wheel arches in from the centre line forward, the boot floor maybe cut out, the reason for this is where we are making them put the floor in then remove a 3rd of it for the fuel tank. New cars that come out from the 1st January 2020 and not to these rules will not be able to replace the inner sills, rear-wheel arches and ‘A’ pillars. They will not be allowed to race the car at any of the associated tracks. The 2019 Spedeweekend advanced tickets are on sale now! Option 1:- You can order your tickets online and choose to have them either sent to you in the post (UK residents only) or collect them from the stadium on the day of the event. Please use the link below to be re-directed to the online shop. Option 2:- Tickets can be purchased by calling us on 01252 322920 and providing your details over the phone. Office hours are Monday – Friday, 9am to 5pm. Please note:- Advanced tickets in 2019 are only available to purchase for the two days. One day tickets must be purchased at the turnstiles each day. E-tickets are not applicable for the 2019 Spedeweekend. Car parking will be £2 per day and is payable on arrival at Foxhall Heath Stadium. Advanced Tickets are available until Thursday 4th July at 5pm. Please Note:- There will be no tickets available to purchase at Foxhall Heath Stadium, Ipswich on Friday 5th July. 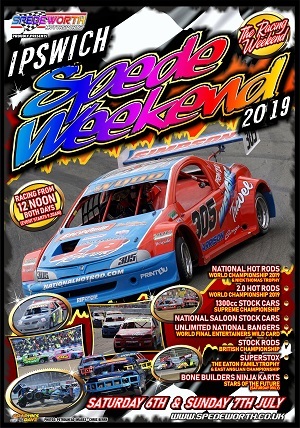 We look forward to seeing all drivers, spectators and staff at the 2019 Spedeweekend in the sunshine at the home of the National Hot Rod World Final! Spedeworth / Incarace would like to announce to all drivers that following the successful practice day on the 10th of April and weather permitting we are planning to run more practice days at Northampton International on certain Wednesday’s from 11am to 4pm at the cost of £45 per driver. 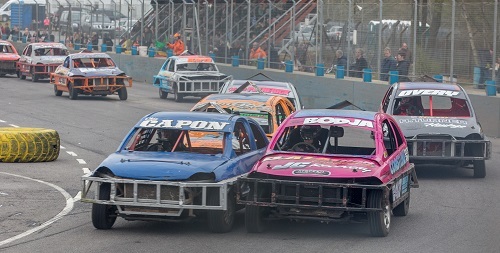 Practice events are also now available at Mildenhall Stadium (weather permitting) which will run on Tuesday evenings from 5pm to 9pm at the cost of £40 per car with driver plus an additional charge of £15 per driver if using the same car to practice. Any drivers who would like to attend we are asking if you can book-in by calling 01252 322920 to give us an idea on the number of different formulas that plan to attend. Drivers are allowed to just turn-up for the practice events but please check the websites before travelling to ensure the event is still running as planned. Over the past few months the rumour mill has run wild with the possibility of Birmingham Wheels Raceway closing down and another track being lost. 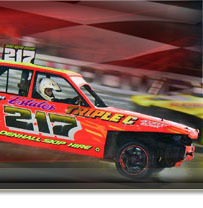 Spedeworth / Incarace are pleased to announce that a new agreement has been signed to continue operating at the raceway. Whilst this is good news for the sport, the new agreement has meant changes within the contract which inevitably include cost increases. As a result, the decision has been necessary to increase the practice fees on a Wednesday night and the Saturday afternoons to £35.00 per driver to try and cover these cost increases of operating the venue. We hope that everyone can understand the reasoning behind the price increase which will help cover the new costs and keep the raceway operational for the future. 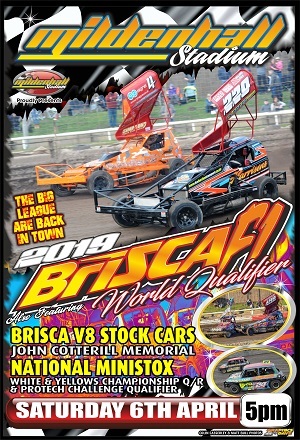 Mildenhall stadium would like to announce that people who have purchased E-tickets for the event tomorrow (6 April 2019) can collect them from the blue container in the pits where the drivers book in.